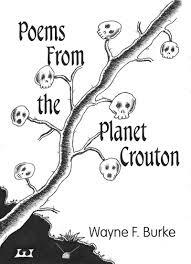 Wayne F. Burke’s latest poetry collection forms part of Epic Rites Press's 2017 Punk Chapbook Poetry Series. The chap includes 14 of Burke’s poems which provide the reader with a small taste of his stuff. The free verse narrative poems are easy to follow and tend to careen towards an exploration of the underlying sexual tensions, violence and hatred Burke sees in his world. Burke recently explained to me, “The title refers to a state of alienation—being on the margin—sort of far out—odd even, or at least different from so-called “normal,” the quotidian. Coming from a place on the fringe, personally and aesthetically.” These poems certainly come from the edge- from the homeless, the abused, the young, the criminally insane- those without power and without a heart beat of hope. I started to yell “Help! my shoes squishing with each step.